Leamington will be the town trialled in a major campaign to tackle the problems of litter. Clean Up Britain, the national environmental behaviour change organisation, launched the Now or Never campaign in Leamington this morning. Rachel Campbell and John Read of Clean Up Britain launch the Now or Never campaign in Leamington. Warwick District Council and Warwick Business School are the lead partners for the campaign which is also being supported by The RSPCA, Blue Cross for Pets, Warwick University's Student Union, Plastic Free Leamington & Warwick, Leamington Town Council, Dart Europe, The British Veterinary Association, BID Leamington, Action 21, Foundry Wood, Wasps Rugby Club, Starbucks and more. John Read, the founder of Cleanup Britain who lives in Leamington, said: "The reason we're doing this 12-month long behavioural change campaign is to test a whole range of social interventions, behavioural nudges, messaging and collaboration modes to see how well or not they work and hopefully identify some successful initiatives that could be considered for up-scaling to the national campaign. being planned by the government. "The only sustainable solution to the enormous environmental and social problems created by litter is to change the behaviour of litterers. "In essence, we're using Leamington as a live test-bed unit to research, identify and experiment with new ideas aimed at persuading people to stop dropping litter." 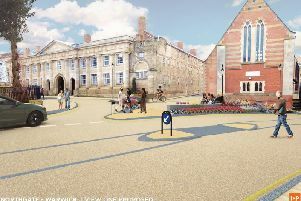 "Clean Up Britain would like to pay tribute to Warwick District Council for having the vision, determination and courage to take part in this pilot campaign. "The Council is aware that litter is unsightly and has corrosive effects on the local environment/community, and has taken a lead in looking for local solutions that could also be applied nationally. "The campaign will use some very emotive and shocking images. We make no apologies for this - they merely reflect the sad and entirely avoidable reality of our littered life." Leamington coffee shops Coffee Architects and Procaffeinate are supporting the campaign through the promotion or reusable coffee cups and free water fill ups for people bringing plastic bottles in. A boards encouraging people to take part in two-minute litter picks in part of the down by allowing them to borrow a litter grabber and use rubbish bags will also be trialled. Cllr Moira-Ann Grainger, portfolio holder for neighbourhood services at Warwick District Council, said: “I’m delighted that Warwick District Council is supporting this initiative. "Our award winning parks and gardens and town centre spaces are well maintained and cared for, but we do recognise that there is so much more we can all do towards improving and protecting our environment. "We hope that by trialling this initiative here in the heart of the country, we will be able to show how making small changes can have a huge impact on the future of our environment." TV presenter Sybil Ruscoe interviews members of Young People First about the launch of the Now or Never Campaign.